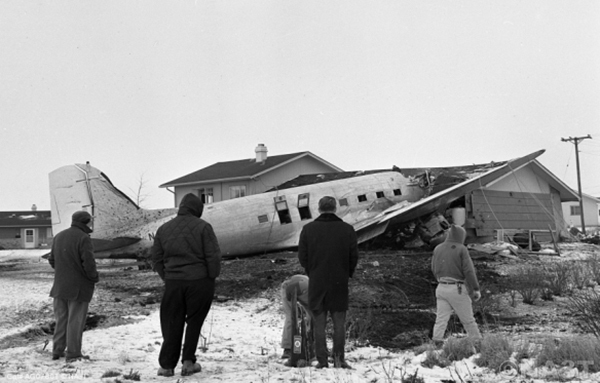 A Douglas DC-3A, N410D, operated by and registered to Hansen Air Activities, crashed into an occupied house 7-1/2 miles west-northwest of the Chicago O'Hare International Airport at 2356 c.s.t., March 8, 1964. The copilot sustained fatal injuries and three of the 28 passengers received minor injuries. None of the six persons in the house were injured. The aircraft was damaged substantially. The crew was attempting an ILS approach to runway 14R in instrument flight conditions when turbulence was encountered, accompanied by a rapid accretion of airframe icing. 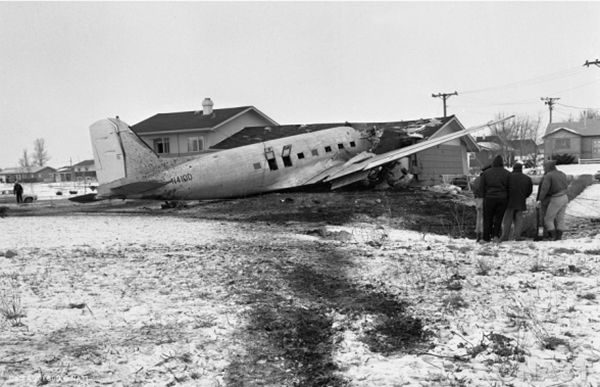 The crew was unable to maintain directional stability or altitude, and abandoned the approach. After leaving the approach course, the aircraft continued to descend in an uncontrolled condition until it crashed. The Board determines the probable cause of this accident was the failure of the crew to utilize available de-icing equipment and engine power to maintain positive control of the aircraft under conditions of rapid airframe ice accretion and vortex induced turbulence.